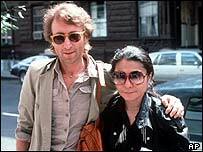 Newly released audio tapes of interviews with John Lennon's assassin reveal Mark Chapman's self-confessed "compulsion" to kill the former Beatle. "It was like a train, a runaway train, there was no stopping it," Chapman told interviewers in a New York prison more than a decade ago. Channel 4 and US broadcaster NBC plan to air excerpts of the tapes for the 25th anniversary of Lennon's death. The singer was shot by Chapman in New York on 8 December 1980. Channel 4 documentary I Killed John Lennon will be broadcast in the UK next month. The tapes were recorded in the early 1990s by journalist Jack Jones, who wrote a book about Chapman and his crime. Chapman describes how he shot ex-Beatle Lennon five times in the back outside the Dakota apartment complex, adding "nothing could have stopped me". "I was under total compulsion," he says. "I'm thoroughly convinced in my conscience and in my heart that there was nothing I could do beyond that point to help myself, totally convinced of that." 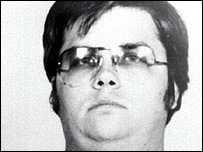 Chapman, who is now 50, said he had hoped his "identity would be found" by assassinating Lennon, who was 40 at the time. "There was a successful man who kind of had the world on a chain, so to speak, and there I was, not even a link of that chain, just a person who had no personality. "And something in me just broke." Chapman, who was arrested at the scene, is currently serving a 20 years to life prison sentence for the murder. He was denied parole for a third time last year after the parole board cited the "extreme malicious intent" of his crime and said releasing him would undermine respect for the law. Lennon's widow, Yoko Ono, has repeatedly lobbied to keep Chapman behind bars, saying he posed a continued threat to her family. Lennon fans organised an online petition calling for him to remain in prison for the rest of his life. Chapman may seek a new parole review in October 2006. The 25th anniversary of Lennon's death is being marked by events worldwide, including a major exhibition on the musician and his work in Paris. The first UK broadcast of excerpts from a 1970 interview Lennon himself referred to as "definitive" is to go out on BBC Radio 4 on 3 December as part of a series of programmes across BBC radio. The interview with Rolling Stone magazine founder Jan Wenner took place shortly after the Beatles split. Lennon documents the group's career and parting and speaks of his strained relationship with Paul McCartney.